A new era in public debate and polarization has dawned in India following the government’s crackdown on students all over the country. In May 2014, the right-wing Bharatiya Janata Party, or BJP, came to power in India with an absolute majority. Corruption scams and ineffective leadership by the previous government had left people feeling frustrated, and the world’s largest democracy voted for what seemed to be a development-oriented growth agenda. While the central government and its leadership started working on implementing this agenda, the BJP’s parent organization, the Rashtriya Swayamsewak Sangh, or RSS — and a student’s wing called the Akhil Bharatiya Vidyarthi Parishad, or ABVP — decided it was time to “fix” the social and moral fabric of the nation. They launched a campaign against all that did not fit in with the mainstream “Hindutva” right-wing ideology, leading to many face-offs between the liberals and leftists on one side and “sanghis,” or right-wing fundamentalists, on the other. One area of the public sphere that felt a subversion of its autonomy was higher education. University campuses came under regular scrutiny, and one of these interventions took a nasty turn when a lower caste doctoral student, Rohith, committed suicide. He was expelled from his campus housing, and his university fellowship was ended after complaints of an alleged attack against an ABVP leader. National dailies have since reported that ABVP activists had originally objected to Rohith’s alleged protest against the death penalty for Yakub Memon, who was convicted for his role in the 1993 Bombay bombings case, among other incidents. The situation escalated into a face-off between ABVP activists and Rohith’s political association for Dalit students. 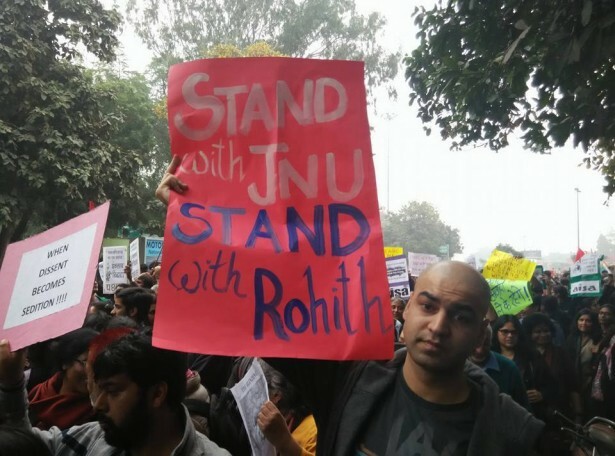 In his suicide note, Rohith wrote, “My birth is my fatal accident.” His suicide on January 17 sparked protests against caste-based discrimination all over the country, including in the Jawaharlal Nehru University, or JNU, in New Delhi. JNU, one of the most respected Indian universities, is known as one of the few bastions of free speech and radical debating culture. This culture of critical thinking has translated into academic rigor that has produced some of the leading thinkers as well as bureaucrats that dominate the political landscape in India and internationally. This culture of critical thinking also means that the institution is strongly anti-establishment. No government has managed to escape its sharp critique, and students routinely discuss and debate issues of critical importance, including excesses by the state in the name of policy or national security. While India has been a victim of terrorism, it has also indulged in excesses in the name of combating terrorism. One of these was the hanging of Afzal Guru, who was convicted of the 2001 terrorist attack on the Indian parliament. He was hanged and his body burned — against his religious rights as a Muslim — in secrecy. Many political commentators argued that the hanging did not follow due process, an allegation that a minister from the previous government acknowledged. This incident, as well as the hanging of Yabuk Memon, has come to be widely regarded in civil society and academic circles as India’s version of the Guantanamo detentions. Given the air of critical debate and discussion that characterizes JNU, on the anniversary of Afzal Guru’s death some students decided to organize a remembrance meeting. Even for someone accused of crimes against humanity, remembrance meetings are a way of reclaiming our common humanity. Since Afzal’s case had been shrouded in so much mystery, he is not accepted as a “terrorist” by sections of Indian society and instead seen as an embodiment of state-sanctioned injustices meted out in the name of fighting terror. This gathering was supposed to be no different. But it unleashed demons that have polarized India like never before and festered conspiracy theories that have shaken the very roots of India’s democracy. At the meeting on February 9, a few students deemed Guru a martyr and the Indian state a tyrant. This led to a campus-wide crackdown by the central government, which said that JNU is home to anti-national elements. In a related twist to these events, Kanhaiya Kumar, the university’s student union president was arrested on February 12 following media reports that he too sloganeered for “freedom.” In the Indian context, any call for “freedom” is read as secessionist, especially in the context of Kashmir or the Northeast. Since Guru hailed from Kashmir, Kumar’s speech — even though he specifically called for freedom “from RSS,” which was cut from the video aired by the media — was interpreted as direct support for the secessionist forces in Kashmir. This became a national story, and Kumar was arrested was on the grounds of sedition. The bizarre incident went one step further with the home minister quoting tweets from a fake Twitter account to claim that the event and campus politics at JNU in general were supported by Lashkar-e-Taiba, a banned terror group. With the so-called evidence being presented, the battle lines between the “right to dissent” and “nationalism” were drawn. Following the arrest, lawyers physically assaulted students at Kumar’s hearing; BJP leaders beat up left-wing ideologues in public, claiming “Mother India” had been insulted; student groups all over the country came to the streets to protest the mishandling of events and the demonization of JNU; and international, as well as civil society activists, cried themselves hoarse as the whole incident smacked of authoritarianism. Of course, shouting slogans may have been naive on the students’ part, or there could have been a conspiracy by the ABVP/RSS ideologues to target JNU for its anti-establishment views. But did this incident warrant the whole might of the government to come crashing down on them, and denounce the university as a threat to “national security?” Universities contribute to nation-building. Targeting them has not only antagonized liberals, but has acted as a unifying force for all who oppose right-wing fundamentalism. The media — and over-simplified accounts of what has happened — have polarized the Indian citizenry. Hate, however, may yet be defeated. In defense of JNU, students and professors of the university have come together to express their dissent in novel ways. Professors at the university have been hosting “open classes on nationalism,” which are live streamed and later uploaded to YouTube. In addition to performing songs of solidarity, students had, early on, also taken charge of shaping public discourse by leveraging social media. One of the first things they did was create a community page on Facebook to share news and updates about “assaults on democratic ethos of the JNU community.” Since being launched on February 15, the page is now followed by over 35,000 people. To reclaim the university as a safe space, students and teachers formed a human chain on campus and launched a peaceful protest movement at Jantar Mantar, in the heart of the capital. 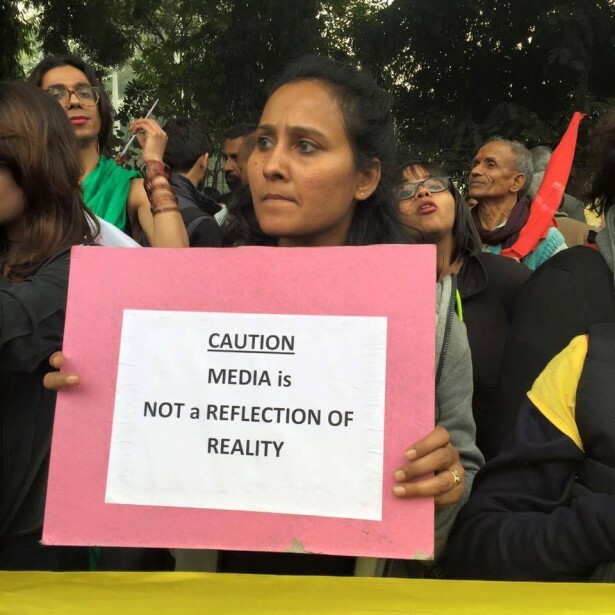 Over 15,000 people reportedly marched in the streets of the capital on February 18 to protest against Kumar’s arrest and to “protect the soul of democracy.” On-campus, students gave those working with the media red roses and asked them not to spread rumors about the university. The outpouring of support from universities, student groups as well as influencers — from all over India and abroad — have helped the movement maintain its momentum. There have been no cases of student-led violence on campus, and the university community continues to emphasize nonviolence as the only legitimate means to seek justice. The so-called nationalists are beating victory drums, and the witch-hunt against JNU students is a reality. Kumar faces many threats to his life. Kashmiri students have vacated campus housing out of fear that they could be targeted next. Kumar’s arrest was followed by the arrest of two other JNU students, who were responsible for organizing the initial remembrance meeting for Afzal Guru, on charges of sedition. Kumar has distanced himself from the other two students, and the situation polarizes. However, not all seems to be lost. Kumar was granted interim bail by the Delhi High Court on March 2, in what is shaping up to be a long battle. As support for JNU continues to pour in, the government has been aggressively putting forth the nationalist argument to defend police action, even amid sharp criticism by opposition parties. Nevertheless, the judicial basis for the arrests seems to be faltering too with the high court criticizing the police on Kumar’s arrest. The students, on the other hand, want to continue to build on the national support and challenge the sedition law itself. Led by the student union, students marched to the parliament, and called for an international day of protest, on March 2 to demand the dropping of charges against JNU students and their release, the scrapping of the sedition law, and the passing of a “Rohith Act” to end caste-based discrimination in educational institutions. These are times of flux, but there are many who are willing to stand up for their rights now, and that is a start. This seems to be a one-sided report supporting student activities and denouncing judicial and governmental actions. While discussing politics and dissenting to what is going on is to be allowed, shouting slogans against the Nation such as ‘we will splinter India’ and protesting against the decisions of the court in a case such as bombing the parliament or the well known Bombay massacre is unwanted. Students should resort to constructive proposals to build the Nation and serve its people. The current student protests, it seems, are specifically created to build up more tension and animosity among the various segments of the society that has been pretty smoothly functional within India. Protesting and fighting for Freedom of Speech is welcome, but the extreme voices they seem to have used against the Nation and Nation-builders can not be condoned. Specific cases of caste discrimination can be contested with proof, if necessary in courts. The question is -Is that what the students in a prestigious university should be doing?